In the north of Mallorca, about 10 minutes from the old-town of Pollensa, is Playa de Port de Pollensa, a nearly 1.5 km long, blue-flag beach that is sure to please all ages of beach goers. Surrounding this popular beach are the Tramuntana mountains and craggy hills of Formentor, a dramatic, natural landscape that adds a special quality to this beach. The long, sandy beach curves around the port, with various sections dedicated to water sports, boating, quiet, sunbathing and swimming. There is a paved boardwalk and beachfront with rows of apartment buildings, shops, and restaurants. As you walk further down the beach, it breaks away a bit from the development, offering a good sized shaded area with trees where you can escape the heat for a bit and enjoy a picnic. 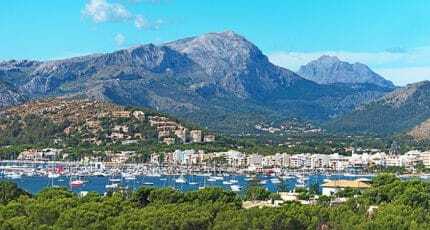 Because of its easy access to everything, Playa de Port de Pollensa is very popular among families, particularly British and German, as well as older and younger people who appreciate all that this northern beach has to offer. You can rent sunbeds and tiki parasols. The water is generally quite calm, a deep blue-green, but with the northern winds it can get choppier, which appeals to some windsurfers and sailers looking for fun. No shortage of restaurant options along Playa de Port de Pollensa; A couple of beach bars offer good food to stay or go, and along the boardwalk and adjoining streets are plenty of diverse cuisines and options, from easy burgers and fries to higher end choices serving paellas, grilled fish, vegetarian, as well as Italian and Japanese cuisine. There are showers, toilets and changing facilities on the beach. Coming from the town of Pollensa, the beach is an easy, 10-minute drive. There is a large paid parking area near the harbour and parking along the streets in the central commercial area of the port as well. Alcúdia, on the northeastern side of the island is about a 15-20 minute drive away. There is public transport to the beach which drops you off in the port, right near the boardwalk. It is not uncommon to see tourist buses here for the day as the scenic beauty and ease of amenities makes it a very popular beach. Playa de Port de Pollensa is very accessible for wheelchairs and disabled visitors. The boardwalk is paved and there is a wooden walkway that goes all the way down into the beach. The shaded, picnic area is another nice spot to watch the beach action but stay cooler. The waters here are not ideal for anchoring a boat for the day, but it is possible to reserve a mooring at the marina. Port de Pollensa is a popular town for cyclists who base their stay nearby here and likely there will be a fair amount of cycling traffic in the port and beach boardwalk as well. A lifeguard is on duty here all summer long. This is one of Mallorca’s prestigious blue-flag beaches and it is diligent about maintaining cleanliness, including recycling your trash as appropriate. There is an incredible amount of water sports and activities along the whole stretch of Playa de Port de Pollensa; SUP, banana boats, jet skiing, waterskiing, windsurfing and kayaks are all available for hire. 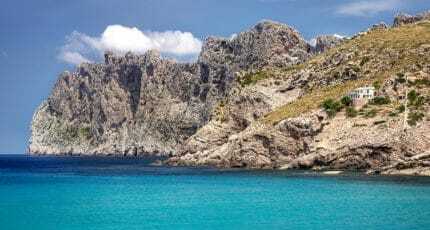 It is also a popular spot to rent a small sailboat for the day and head out on the open seas, or be a part of a boat tour to go look for dolphins or just to navigate the stunning scenery of Cap Formentor. There is also a dive school here and you can sign up for day and nighttime dives. For children young and old, (and that means adults too), there is a floating waterpark in the sea with bouncy castle and slides, which you pay to access for play. On the beach are volleyball courts and a children’s play area right on the sand. Different zones along this beach indicate water sports from swimming areas, so it remains safe and monitored, especially for younger children. Off the beach, spend the afternoon browsing in the many boutiques or treat yourself to a massage or wellness treatment from a number of stands that set up in the summer months right along the boardwalk. There are some easy walks along and near the beach, such as the Pine Walk, a favourite stroll of the novelist, Agatha Christie, who spent a lot of time in this part of the island. The promenade passes by a quieter area of the beach, called D’Albercuix, that backs up to pine trees and where you can still rent sunbeds and parasols. 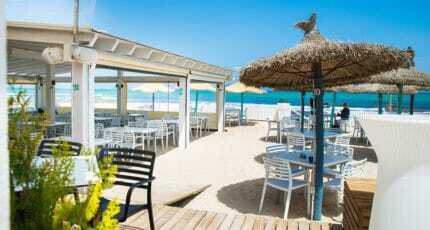 There is a popular beach bar, or chiringuito, along the main beach, an easy option if you want to remain in your bathing suits with sandy feet for lunch. Venture off the sand and along the boardwalk and in the side streets of the port where there are many restaurants with gourmet meals such as Stay, which offers a great 3-course menu, to easier and faster options serving kid-friendly food, as well as international cuisines, such as Italian, French and Japanese. 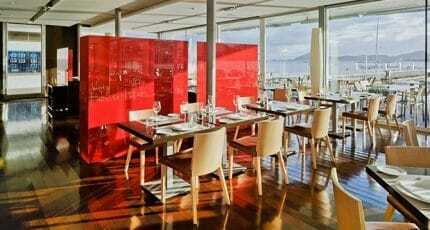 The popular chain, Cappuccino has a waterfront cafe and restaurant here that is open from morning until night. Prepare a picnic in advance, there are several supermarkets in the port, and eat in the shade under the pine trees. What is fortunate about the Port de Pollensa is that strict building laws were put in place before any high-rise buildings could be built along the beach front. All of the apartments and hotels are lower rise which creates a more intimate ambiance and deters the larger crowds and package tours. That said, there are plenty of great hotel and rental options here which make it an ideal place to base a holiday. Many people appreciate the more isolated feeling of Pollensa and the port, as it is nearly the farthest point from Palma (about 65 km). Nearby the beach, the Hotel Lleanaire is a lovely, manor-like hotel surrounded by nature and the Hotel Illa D’Or, a favourite place to write for Agatha Christie, has recently been revamped into a contemporary wellness hotel and spa. There are options for all budgets here, and plenty of self-catering apartments. Of course one of the most famous hotels just a few kilometres away is the Formentor, a Royal Hideaway, a hotel now run by the Barcelo group, which maintains its early 20th century charm with completely contemporary amenities and services. There are many lovely hotel options in the village of Pollensa, including charming boutique hotels with good restaurants, or head into the surrounding landscapes to stay at a rural, finca style hotel. A visit to the Cap de Formentor is only a few kilometres away by car and one of the most dramatic and scenic parts of Mallorca. The old-town charm of Pollensa, with its rich history and tree-lined plaza where a lively market takes place on Sundays, is full of good shops, fashion as well as design, such as Teixits Vincens, a textile manufacturer that produces, among many styles, the famous “cloth of tongues,” with its lovely, geometric print seen frequently across the island. Cala San Vicente is another nearby beach and popular holiday destination between the port and Pollensa, with beautiful, clear water. Golf Pollensa and Golf Alcanada are 10-15 minutes drive from the port. Both offer 18-hole courses that are well manicured, a clubhouse and restaurant. Explore the majestic Tramuntana mountains, which offer incredible hiking paths of all levels, including the Puig, the 330-metre high peak that is a favourite climb for many to see the views from above. This area is also a popular spot for bird watching. We hope you have found this article about the Playa de Port de Pollensa useful and that you have many memorable stays in Mallorca as a result of our recommendations.